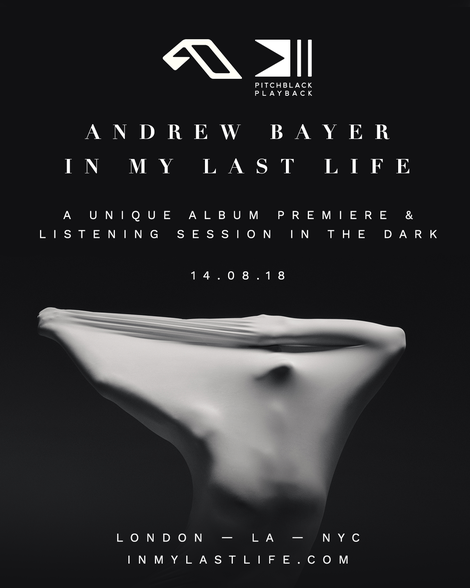 You can be one of the first to hear Andrew Bayer’s third studio album, ‘In My Last Life’, in a dedicated listening environment, a unique album premiere experience in collaboration with Pitchblack Playback. Taking place across three boutique venues in London, Los Angeles and New York, those in attendance will be given a blindfold and asked to switch off their phones for an intimate, distraction-free premiere of the album in the dark. Venues have apparently been selected for audio quality, comfort and location. For your chance to attend, pre-order Andrew’s new album in any format (vinyl, CD or digital) from the Anjuna Music Store. All pre-orders (including those already purchased) will be sent a ticket link and unique code on Tuesday, 7 August. Claim your ticket from 10am (local time) on Wednesday, 8 August. Pitchblack Playback isn’t aimed at audiophiles; it’s simply for lovers of music who still value the album as an art form and who want to hear their favourite records and exclusive first plays through the most immersive, detailed and visceral sound experience possible. You'll feel the bass in your body and hear details you never noticed before. Your hearing is heightened when your vision is cut off and it only serves to make the music feel more intense. The lights will be dimmed to their bare fire safety regulation minimum with sleeping masks provided for the full lights-out experience. Andrew Bayer’s ‘In My Last Life’ is out 24 August 24 on Anjunabeats.